NEW YORK (March 3, 2017) – FlightSafety International introduces a new Operations Control Specialist course for Helicopter Air Ambulance operators. “This initial course teaches the skills needed to serve in the operational control support role and to apply those skills and techniques to effectively identify and mitigate risk in real time within the context of Helicopter Air Ambulance operational environments,” said Steve Gross, Senior Vice President, Sales. The course is designed for pilots, communications specialists, airline dispatchers, and other aviation safety professionals. The topics covered include Aviation Weather, Navigation, Flight Monitoring, Air Traffic Control, Aviation Communication, Aircraft Systems, Aircraft Limitations and Performance, Aviation Policy and Regulation, Human Factors/Crew Resource Management and Local Flying Area Orientation. It is compliant with FAR 135.619 and Advisory Circulars 120-96A & 135-14B and can be taken at a FlightSafety Learning Center or at a Customer’s location. The Human Factors portion of the course includes expanded instruction in Crew Resource Management and Aeronautical Decision-Making specific to Helicopter Air Ambulance operations. The course also features a module that includes simulated scenarios that enable attendees to apply what they have learned in real-world and real-time. Although the course was designed for the Helicopter Air Ambulance industry, it will also benefit aviation law enforcement, electronic news gathering, tour operators, firefighting, and other helicopter operators. 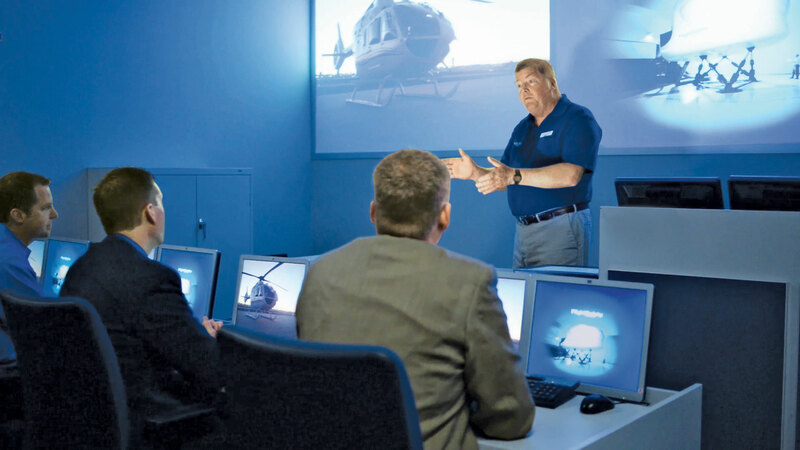 FlightSafety provides training for helicopters built by Airbus Helicopters, Bell Helicopter, Leonardo Helicopters, and Sikorsky. Courses are offered at two locations in Dallas, Texas and in Denver, Colorado; at the Farnborough airport in the United Kingdom; Lafayette, Louisiana; Singapore; Stavanger, Norway; West Palm Beach, Florida; and at Metro Aviation’s Helicopter Flight Training Center in Shreveport, Louisiana.